On 20 March, Attorney-General Nicola Roxon agreed to a Department of Foreign Affairs request to block public access to 34-year-old cables on the famine that ravaged East Timor early in the Indonesian occupation. Roxon reportedly believes that release of the material would prejudice Australia's international relations. Given that Suharto and his regime have gone and that many other sensitive cables on the Timor question have been released over the last 12 years without damaging Australia's external relations, the decision is puzzling. As someone who has spent many years working with both East Timorese and Indonesians to understand their shared history, I would argue that rather than cause for concern, the release of the cables would be generally welcomed in both countries as part of the free flow of ideas and information that both now enjoy. Australia, as one of few witnesses to these events, should contribute what it knows so that these dark times are better understood and learned from in East Timor, Indonesia, Australia and elsewhere. The famine of 1977–79 cut a swathe through East Timor's civilian population like the third horseman of the Apocalyse. Having failed to subdue the Timorese, the Indonesian military opted to starve them out. In addition to destroying food sources, forcing the population to flee and abandon gardens, the military also blocked international agencies from delivering aid until the army had achieved its military objectives. When the US Catholic Relief Services was permitted to survey the situation in May 1979, its representative found conditions as critical as anything he had encountered during his 14 years experience in Asia. The famine, he reported, was not only claiming the very young and very old; many in their prime were also dying. Most of the over 100,000 civilian deaths in East Timor during the 24 year war occurred at this time. The significance of the famine to the Timorese was brought home in the course of the Commission for Reception, Truth and Reconciliation's (CAVR) inquiry conducted after independence. Witnesses explained that Timor was no stranger to malnutrition, seasonal hunger or other tragedies, but this was the mother of all catastrophes. Whole families and communities were wiped out by starvation. Maria Jose da Costa's account was reminiscent of a 1950s rabbit drive in Australia: the military sprayed the long grass with gasoline and set fire to it to drive people out. Unable to run due to hunger, the elderly were left behind and died where they sat, defiant and dignified, dressed, she said, as if they were going to Sunday mass. The famine dwarfs the Santa Cruz massacre and similar atrocities in scale and significance but is far less well known or analysed. This information gap is principally due to restrictions on access to East Timor applied by the Indonesian military until 1989. As a result most Indonesians are not only ignorant of what happened but continue to believe the Suharto regime's claims that the military was doing good work in East Timor. Knowledge of what really happened is therefore an important corrective. It will help Indonesians understand why East Timor chose to separate from Indonesia in 1999 and why civilian control of the military is critical. The period is also a blind spot internationally. Journalists continue to attribute the death-toll in East Timor to shooting and bombing rather than starvation, and researchers are unaware of the famine. Cormac Ó Gráda, an Irish expert on famine, makes no mention of East Timor in his 2009 study Famine, A Short History, though he provides analysis and lessons from totalitarian famines of the 20th century in Stalin's USSR and Mao Tse-tung's China. 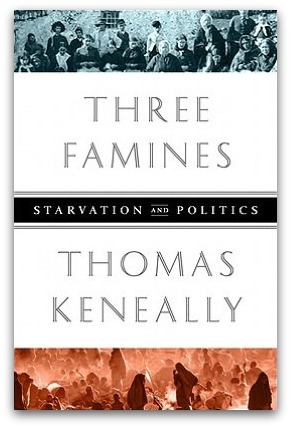 Likewise Thomas Kenneally's book Three Famines: Starvation and Politics does not include the famine that occurred on Australia's doorstep though it illustrates his thesis. East Timorese want to know more about the events that forced them to abandon families and have left them troubled because remains cannot be found for reburial according to custom. They also want to know why a crime of this magnitude has not been accounted for. Australia can help them because it was a witness and what it saw is presumably contained in official cables from the time. Australia's ambassador to Indonesia was one of 11 diplomats to visit the territory in September 1978. Shocked at what he saw, he joined colleagues from Canada, Japan and the US to call for urgent relief. Assistance did not arrive until 12 months later, too late for many thousands of innocent people. It will be hard to look an affected Timorese family in the eye today and explain why, over 30 years later, Australia does not want them to know what it knows about this catastrophe. It is shocking that these cables are being suppressed. Roxon is showing herself to be an authoritarian and paternalistic attorney-general, despite her claims to support open debate. I can recall being involved in action to feed starving people in Africa in the 1970s, at the very time tens of thousands of people were dying agonising deaths on our nations doorstep. The resulting sad sense of collective shame is only exasperated with Nicola Roxon's decision to secrete information that could flash a light on our national cowardice. Like all nations, we have a shadow side that only grows in haunting capacity when hidden. I for one call on the federal government to release clear evidence of our silence as this genocide that was occurring in this land of terror. How else can we learn to challenge events such as these as they occur again; which they surely will? Any information that may help bring this war crime to the notice of the public should be released by the Australian government. It has a duty to do so so that people can be aware of the circumstances that caused so many needless deaths. We must all be told the truth of the events and know who suffered so much and those who imposed their brutal methods of killing these people. The East Timorese hardly need Australians to tell them what happened to them - they can write their own history, as they lived it. I disagree with the author that Indonesians would welcome such a 'free flow of ideas'. I think many Indonesians would see the release of these old cables as yet another Indonesia-bashing exercise by Australia. In 2010 I spent one month in Fohorem, East Timor. In 2011 I spent three months in ET. I read a lot of books about ET but I did read about the famine until I went to the Famine Museum (I think it's called that) in Dili. We had a remembrance Day while I was there last year for 1977 and 1999. I wondered about 197. Thank you for your informative article. Why don't people/governments realise that if they hide things people know they have something to hide? Just as the Sri Lankan government's refusal to allow an impartial body to investigate stories of atrocities in the recent civil war there tells the world that they were guilty, so Australia's refusal to allow facts about these famines to be made known tells us that Australia was complicit in them, and makes us wonder how much. Well done Pat. Thank you, Pat, for this account of East Timor's famine. If the truth shocks us, so be it.We needn't make this a point of irritation for the Indonesians,rather let our neighbours see Australians as people prepared to acknowledge with real sorrow their shortcomings in their treatment of the Timorese to whom we owe so much. Maybe we should petition the Greens, they took hold of the Inquiry into Forced and Illegal Adoptions, Sarah Hanson-Young's voice overides everyone else's on the refugee problem, another win could gain them votes in the next election. Pat, I too share your disappointment, and found out just having read your commentary. I had sent a letter to the Attorney-General, outlining my reasons as to why I believed the material should be public. It is a sad part of our history, and one that gives me no comfort. I am frequently amazed at how wrong our relationship with Indonesia, is interpreted.